It is with sadness that we have to report the death of Angus Cameron Morrison. The 78 year-old ex Rams striker passed away in Derby yesterday Wednesday 18th December. Born in Dingwall on 24th April 1924 Angus Morrison started his football career with Ross County. He moved to Derby County in October 1944. In today’s football circus and multi million pound transfers, Morrison was a very cheap capture for the Rams. His fee? A box of cigars! After playing 52 times for Derby and scoring 21 goals Angus was sold to Preston North End in November 1948 where he had nine years of success, not only did he play 262 times he also scored 70 goals. 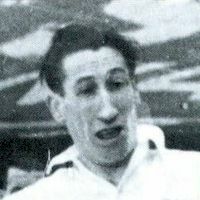 In his time at Preston Morrison helped his team to second place in the 1952-53 season in the old first division and scored in an FA cup Final against WBA a year later in 1944. Unfortunately for Angus he ended up with only a losers medal that day. In 1957 Morrison was transferred to Millwall where he scored four goals in his 15 appearances for the Lions. From the Den Angus moved to non-league football being either player manager or manager of Nuneaton Borough and Belper Town. He also had a period as coach to Ripley Miners Welfare. Angus Morrison was also a regular visitor to Pride Park and will be sadly missed by all that played with and knew him. Derby County Mad sends their deepest sympathy to all family and friends. Angus Morrison’ league statistics can be found by clicking here.